The grey-green, banana-like leaves grow to about 1.5m in height and the flowers stand above the foliage at the tips of long stalks. In our climate the mature plants bloom most of the year and easily reach a width of 1m. Each plant can produce as many as three dozen flower spikes a year, which will last up to two weeks when cut. The structure and pollination of the flowers are quite fascinating: The plant is ornithophilous, which requires nectar-eating birds to pollinate its flowers. The flowers, which emerge one at a time from the spathe, consist of 3 brilliant orange sepals and 3 bright blue petals. Two of the blue petals are joined together to form an arrow-like nectary. Pollination occurs when the bird rests on the blue petals to sip the nectar. 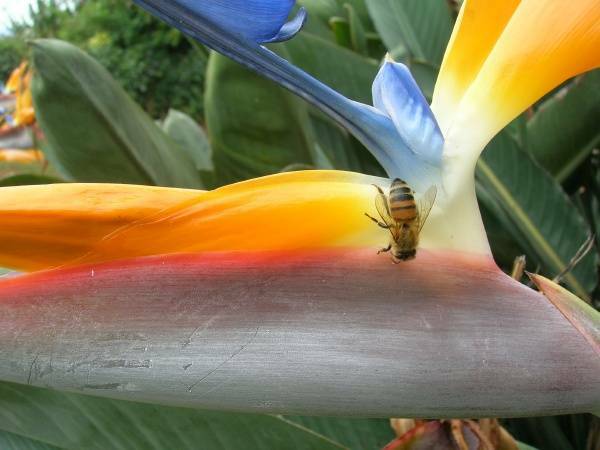 This causes the blue petals to open, which coats the bird's feet and breast with pollen, ready to be deposited on the sticky part of the next strelitzia flower it touches. The seed pods develop over the next six months and produce a pod with three sections of black seeds, the size of sweet pea seeds, with bright orange arils. 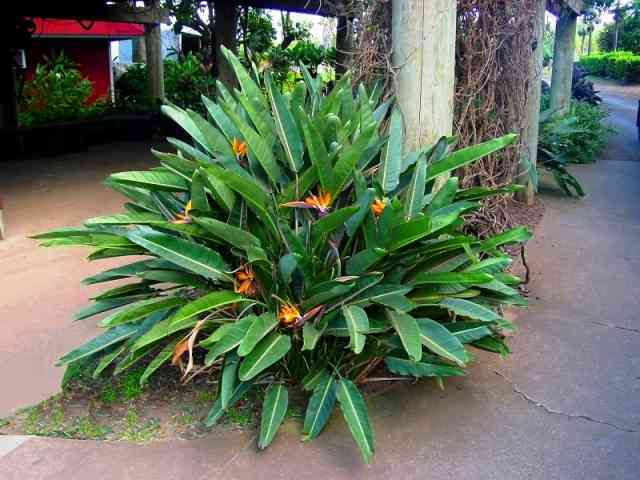 Strelitzia reginae are easy plants to grow in the garden (Or in a large pot). They are very tolerant plants that will thrive in most soils and can survive with very little water once established. However, they do best in a rich loamy soil with good drainage and regular watering. The plants are also wind resistant and grow well in coastal gardens as the leathery leaves will tolerate light salt spray. Strelitzias are sensitive to cold and would need a sheltered position in areas with frost. For good flower production, place plants in sunny or partially shaded locations. Plants grown in partial shade will be taller and have somewhat larger flowers. In full sun, plants are smaller and flowers are on shorter stems. 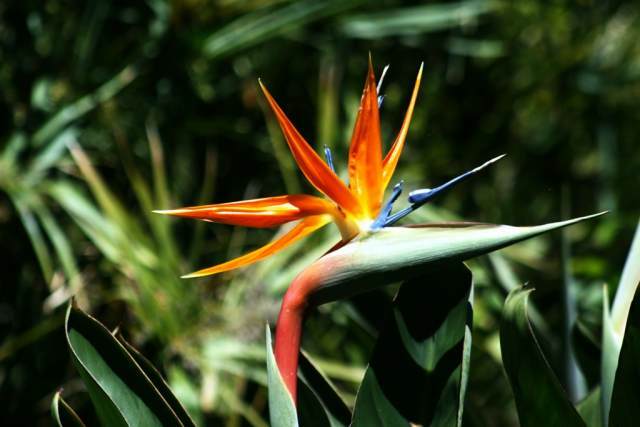 Bird-of-paradise tends to produce more flowers along the outside of the plant, so make sure to leave adequate space for flowering in between plants. The planting hole should be dug 2 to 3 times the diameter of the root ball. Make it as deep as the root ball is tall. Before planting, thoroughly water the plant and remove it from the container. Gently place the plant in the hole, making sure the top of the root ball is no deeper than the soil surface. Fill up with soil and water generously. The success or failure of a new planting often depends on whether the plant receives adequate moisture during the establishment period (i.e., the first six months). Dry or soggy conditions will cause leaves to yellow and eventually die. Once established, bird-of-paradise prefers frequent watering during the warm growing season. During the winter months, plants should be watered only when the soil is fairly dry. Strelitzias are heavy feeders and appreciate regular feeding with a slow release, or water-soluble fertilizer. Mulch placed around the base of plants helps conserve moisture, stabilizes root temperature, and reduces weed infestations. Keep an area around the stems of plants free of mulch. Mulches against the stems of plants increase the risk of stem rot. 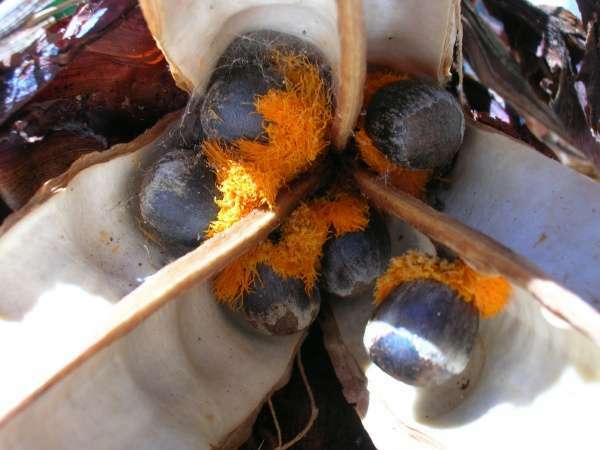 The bird-of-paradise is relatively pest free, but dead leaves and old flower stalks should be removed to increase the aesthetic quality of the plant and to reduce the chance of fungal organisms building up on the dead tissue. Propagation is by seed or division. Division is the easiest method and will produce mature, flowering plants in one to two years. Dig up and separate old clumps, dividing those with four to five shoots into single-stem divisions. Plant divisions at the same soil depth at which they were previously grown. Keep the soil moist until roots are established, then begin fertilizing. The plants are slow growing and large clumps that are split or moved will take about two years to re-establish and flower again. To get a mature flowering plant from seed will often take about five years. Germinating the seeds is a challenge that requires patience. For best results sow fresh seed in spring. Before sowing, the hard seeds must be scarified (nicked or scratched) before they will germinate. To scarify, remove the orange tuft and soak the seeds in lukewarm water for several hours, then nick them with a knife or small file until you see the white �flesh� of the seed. People with sensitive skin may have a reaction when removing the outer coverings or tufts so it is advisable to use gloves when preparing the seeds. Sow in seed trays filled with a well-drained soil medium at a depth of 1,5 times the size of the seed. To ensure a moist, humid environment, cover the seed tray with a sheet of glass or place it in a clear plastic bag and place it in indirect light. A constant temperature of 25 C is most suitable for germination as low temperatures retard germination. Most seeds will germinate in one to three months, but some might take as long as six months. Seedlings should be a good size before being transplanted (two to three leaves). Fertilization can begin at this stage. 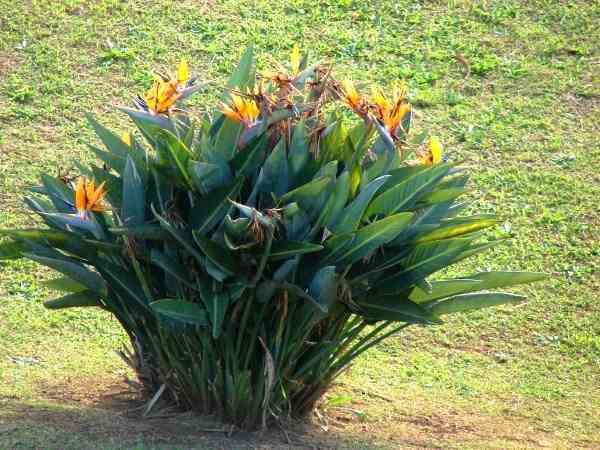 Young strelitzia plants should be grown in shade as the leaves tend to burn in direct sunlight. As a final note, I would like to thank Forest & Kim Starr of Hawaii for the use of their beautiful photos.